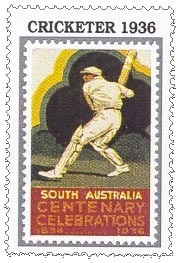 Reproduction in full colour of the 1936 poster stamp showing Don Bradman for the Centenary of South Australia, size of label 28 mm x 42 mm. 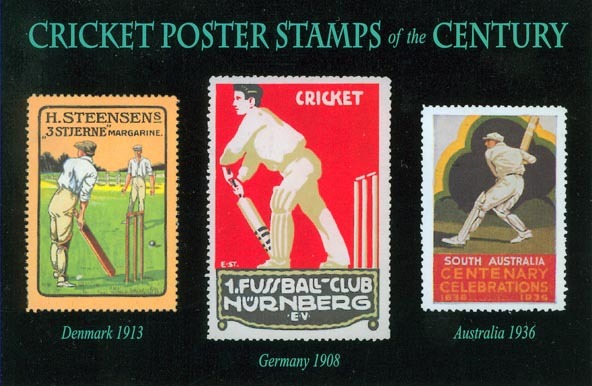 Inaugural issue shows the logo (Batsman Kangaroo) and motto (Have A Go! Australia) of the service, 1,500 printed on gloss paper in three colours, label is 52 mm x 32 mm. 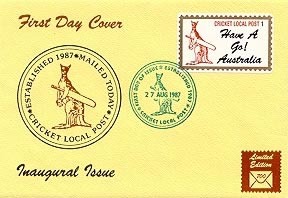 First day cover, 110 mm x 160mm, 700 printed in two colours to which is affixed label No 1, cancelled first day of issue, 27 August 1987. The label is printed on matt paper with insert. 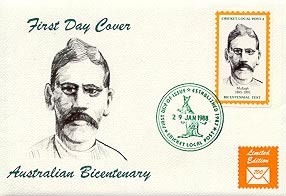 Australian Bicentenary issue shows Unaarimin (1845-1891), whose European name was Mullagh, the star all-rounder of the first Australian team to tour England, issued on 29 January 1988, first day of the Bicentenary Test Match, 1,500 printed on gloss paper in three colours, label is 32 mm x 52 mm. First day cover, 110 mm x 160 mm, 700 printed in three colours, label No 2 cancelled first day of issue, 29 January 1988. The label is printed on matt paper, with insert. 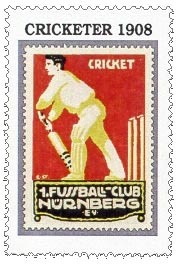 Cricket Philatelist International (CPI) issue shows the logo (red cricket ball) or the proposed society and a globe (in black and white), issued on 24 Oct 1990; 1,500 printed on gloss paper in three colours, label is 52 mm x 32 mm. 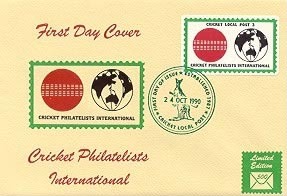 First Day Cover, 110 mm x 160 mm, 500 printed in three colours, cancelled first day of issue, 24 October 1990. 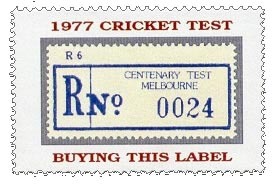 The label is printed on matt paper, with insert. 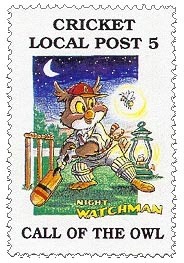 Night Watchman by master cartoonist Dave Bennett, Van Nuys, California, titled Call of The Owl, issued 10 April 1998, 1,000 printed in full-colour, label is 28 mm x 42 mm. 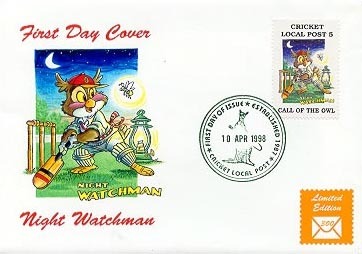 First Day Cover, 110 mm x 160 mm, 300 printed in full-colour, cancelled first day of issue, 10 April 1998, with insert.